The MKs were quickly escorted from the hall. At least one had to be physically removed. Knesset Speaker Reuven Rivlin denounced the brief protest, which violated Knesset protocol. “You should be ashamed of yourself. 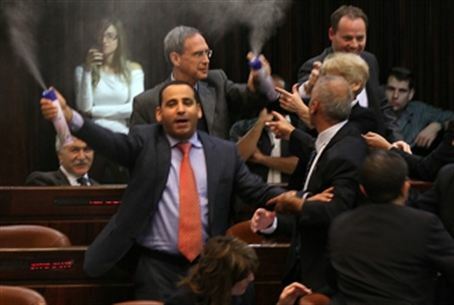 You are a disgrace to Israeli democracy,” he told the protesting MKs as they were escorted from the hall. Members of the coalition, however, appeared amused. Prime Minister Binyamin Netanyahu was seen chuckling at the outburst. Kadima was protesting the creation of Independence, a party created this week by Labor head and Defense Minister Ehud Barak. Several MKs went with him, leaving the historic Labor party in the opposition and facing an uncertain future. Barak has defended his decision, saying Labor had drifted too far to the left. Likud responded in kind, with MKs saying, “For the next three years Kadima will have its gimmicks, and Likud will stay in power. Likud will have government portfolios, Kadima will have police files.” Kadima has often been criticized over the large number of current and former party members charged with corruption. Kadima, like Independence, was formed when a group of MKs from within a larger party – Likud – led by their party leader decided to create a new faction, leaving many members of the original party suddenly in the opposition.